If you’ve ever suffered from weighed down strands or fought with coarse curls on a daily basis, you know that your hair has individual needs. And like our hair, not all shampoos are created equal. So before you move onto the details — the serums, sprays and leave-in conditioners — first start at the base. Finding the best shampoo for your hair type, whether it be frizz-prone or color-treated, is essential to having healthy, manageable strands every day. “It’s always a good idea to target your hair’s specific needs, but products that are ‘for all hair types’ can be great for someone who has normal, healthy hair,” Clear Scalp & Hair Beauty Therapy celebrity stylist Jen Atkin told us. Your main concern is finding a formula that nourishes, smooths and detangles, like Oribe Signature Shampoo ($34, Oribe.com), which cleans hair with non-stripping coconut-, corn- and oat-derived cleansers. Aveeno Pure Renewal Shampoo ($6.49, aveeno.com) is a sulfate-free formula with seaweed extract to balance strands’ moisture level without stripping hair of its natural oils. Also try L’Oréal Professionnel Mythic Oil Nourishing Shampoo ($27, lpsalons.com), which contains argan and cottonseed oils to nourish hair. Most shampoos contain detergents whose sole purpose is to remove dirt and oil from strands, but they also strip color molecules from the hair cuticle. 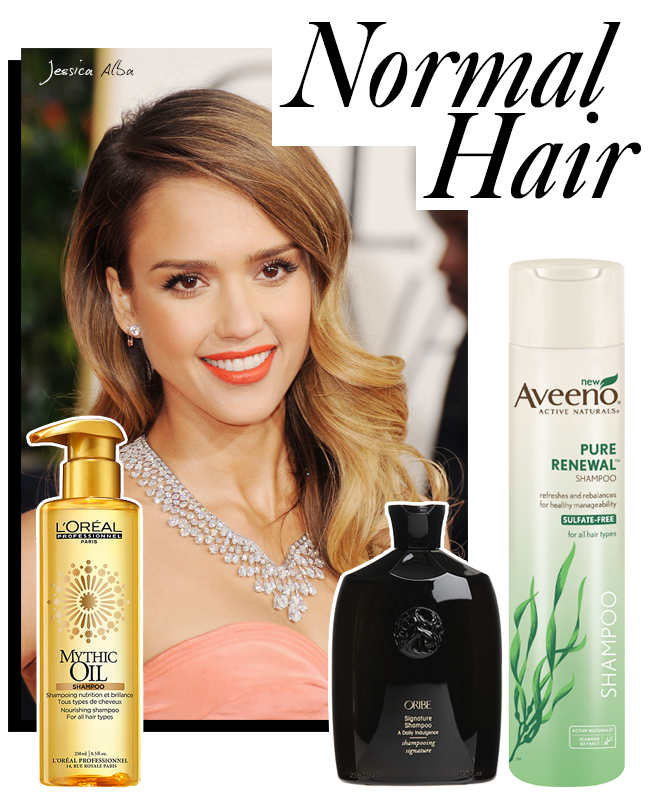 For color-treated strands, you want gentler alcohol- and sulfate-free formulas. Pureology Hydrate For Dry Colour-Treated Hair ($27, pureology.com) is packed with soy, oat and wheat proteins that smooth the cuticle, giving hair a vibrant shine, and has a purple tint to counteract brassy tones. The brand’s new line, Reviving Red, is designed specifically for red or copper color-treated hair that fades at a faster rate than any other hue. Other shampoos to try: Pantene Color Preserve Shine Shampoo ($4.99, panetene.com) and Rene Furterer Radiance Enhancing Shampoo ($23, renefurtererusa.com). For naturally curly haired gals, you want a shampoo that tames curls by restoring bounciness and eliminating frizz. Use a nourishing shampoo, such as Fekkai Perfectly Luscious Advanced Curls Shampoo ($25, fekkai.com), that sustains the hair’s natural oils so strands don’t dry out. Other favorites are DevaCurl Low-Poo ($18.95, mydevacurl.com), a low-foaming, sulfate-free cleanser, of course, the curl expert, Ouidad’s Clear & Gentle Essential Daily Shampoo ($14, Ouidad.com). No matter the cause for frizz — be it dry, coarse curls, heat damage or exposure to humidity — the key is to moisturize and smooth. The new Tresemmé Keratin Smooth Shampoo ($5.79, tresemme.com) is infused with keratin proteins for smooth, shiny strands. Moroccanoil Moisture Repair Shampoo ($21.80, moroccanoilproducts.com) is also packed with keratin proteins, as well as argan oil to restore hair’s moisture and manageability. Bumble and bumble Bb Straight Shampoo ($29, bumbleandbumble.com) has a heat-activated formula that helps loosen the hair’s natural curves as you blow dry after washing. A main sympton of dry, brittle hair is damage. 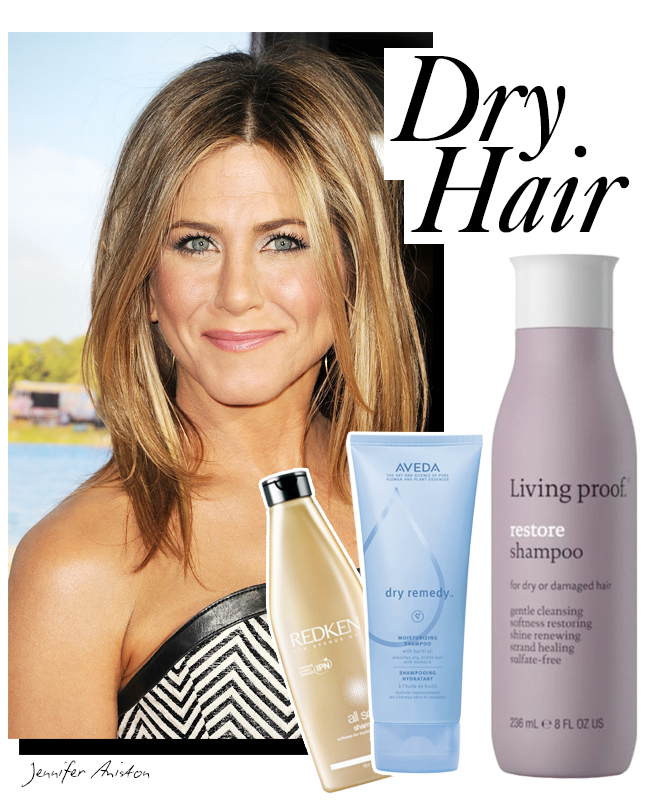 To target dryness and damage, you want a moisturizing shampoo that also cleanses and restores health. Living Proof Restore Shampoo ($28, livingproof.com) contains a moisture-controlling molecule, OFPMA, for hydrated, bouncy strands. Others to try: Redken All Soft Shampoo (TK, redken.com), which is rich in argan oil to soften coarse hair, and Aveda Dry Remedy Moisturizing Shampoo ($24, aveda.com).